This is one of those times when I really shouldn't be blogging. We've hit that point in the semester when every test, project, and paper is coming up, which means that my to-do list a mile long, and blogging should not be top priority. Naturally, I'll always find away to ignore the massive amount of studying I should be doing to write about polka dots and blazers instead. It's much more interesting than researching Japan's textile industry. It's been a little while since I've worn polka dots on here, which means that it's been far too long for my liking. I thought this polka dot dress was a fun piece to wear under my new professional-looking blazer from Brag Vintage. Brag Vintage is a great British vintage shop, and I had the hardest time choosing my favorite piece. I ended up settling on this beauty because, despite my love of them, I hardly own any blazers. I have one black one that fits well, and I wear it death any time I have to look even semi-professional. I really love the color and shrunken feel to this one, so I know I'll be throwing it on for next presentation coming up in a class. I should apologize that my posts have been so photo-heavy, but I'm incredibly indecisive. Mary and I have been having a blast scouting new locations, and when we drove past this mosaic (which I've seen a million times, but never really gave a second thought), we both knew it was perfect for this outfit. Despite my workload piling up, I still managed to have a nice, relaxing weekend. I ended up staying in both Friday and Saturday nights, which was refreshing. I did go to a casino in Iowa for the first time since being legal with a few of my guy friends on Saturday, and I had a blast. I don't really trust myself to gamble, but the casino gave us each $10 to spend for signing up for player's cards, and it lasted me a few hours on the penny slots. I didn't come home with any winnings, but I managed to only spend $1 of my own money, so I'd say it was extremely successful. Cute outfit! I love that blazer on you! Haha I used to find just any excuse to procrastinate on studying and getting projects done when I was in college so I feel ya! Cute dress, as always. I'm having a love affair with polka dots lately so that dress really stood out to me. Also, your styling is just excellent! Good for you for managing to find a way to still have a good weekend. I swear this senior year has turned me into a total procrastinator and I always regret it on Monday! Shoes, Dress, Blazer. Loving it. It's always awesome when you find a new place to shoot, even if it's been under your nose the whole time! So much beauty in the world sometimes it's hard to decipher which to use! Loving this blazer!!! It looks amazing over the polka dot dress and with that scarf. Definitely the perfect piece to polish any look off and still be very you. These photos are stunning! You look so great and I love that polka dot dress! Good luck with your crazy to-do list! that blazer is absolute perfection. it's a gorgeous color and i bet the fabric is so lovely! 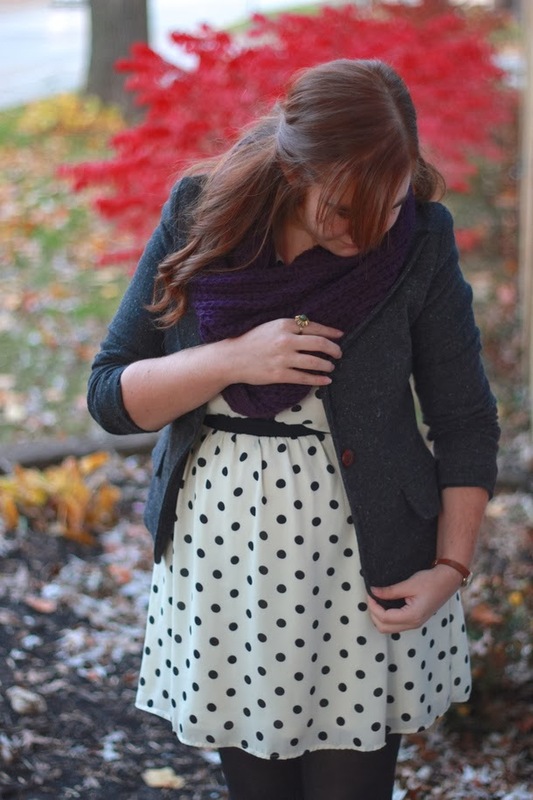 cute unexpected layering with the polka dots and tweed. That blazer is lovely! It does strike me as very British =P And I adore the last photo. 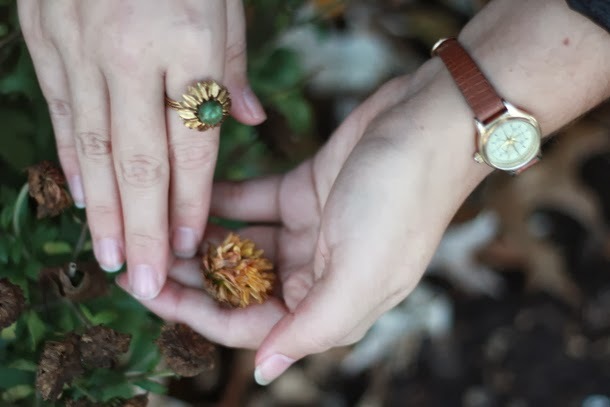 Flowers and jewelry. . . perf. I'm surprised you don't own too many blazers, I think they work with your closet so well. Of course, I'm totally loving this dress and you guys picked the perfect photo location for this outfit. If only I had someone to motivate me to leave my home to take pictures! I hope I get to see you later this month, we have to get something solid planned with Erica soon! Haha go you for not going bankrupt! I've never gone gambling before, but I'm pretty sure I'd lose my mom's house by the end of the night. So there's that. Haha also love that blazer of yours! I have SO many and don't know how to style them. Talk about a face palm. What a cute blazer! 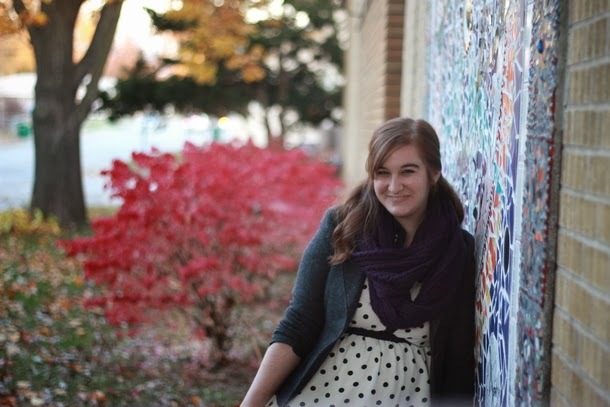 That mosaic wall makes a perfect back drop and how fun that you have a friend to take photos with! Well done at the casino, I hate gambling money away and the few times I've gone I'm always such a conservative player :) Not my thing. 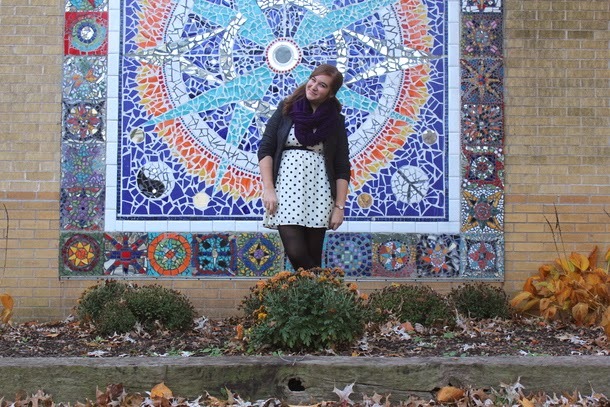 What a cool backdrop, and I love the polka dots dress and chunky scarf combo! 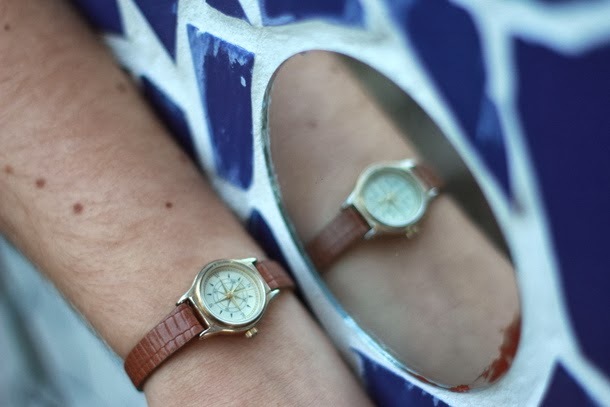 That photo of your watch in the mosaic glass is extra cool! 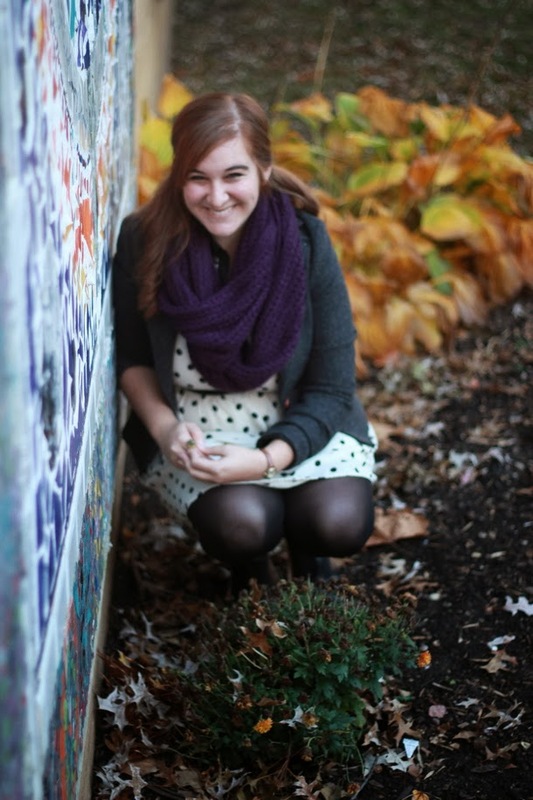 Can I rent your friend to help me with pictures ;) She is doing such a good job! Good luck on your schoolwork! Great photos! Love the happiness and confidence you're radiating in these :) Love the blazer too - totally gotta get one now! That mosaic makes such a gorgeous background!! 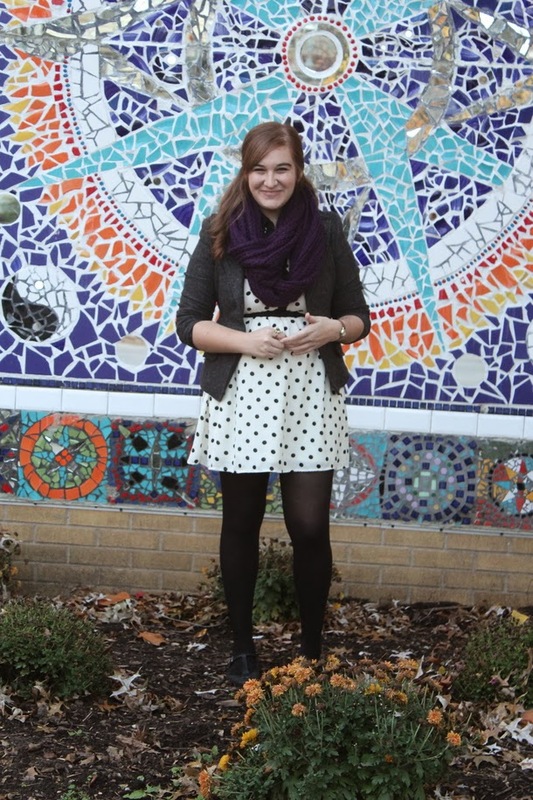 I always love a good blazer, dress and tights combo :) Especially when it involves a lovely purple scarf and some polka dots! Love the polka dot dress, and oh, Brag Vintage! I'm supposed to be in their affiliate program but I never got a notification or anything from them... I should check on that... Anyway, I love this mosaic background!! How perfect. Glad you found time to blog in the midst of everything else that's going on!! You look beauuuuutiful. 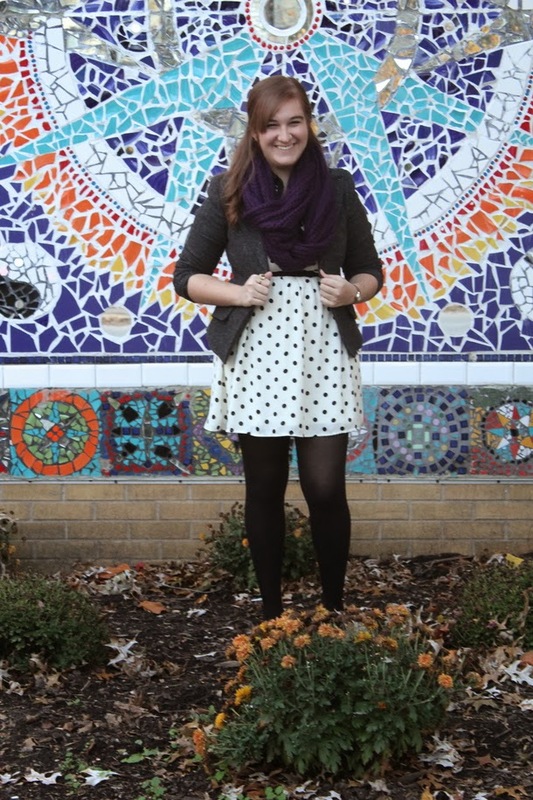 Love your outfit, especially the polka dots! Beautiful background too :) I really enjoy your blog so far and would love to follow each other--please join my GFC and I'll follow you right back! I dig this outfit. Its adorable and I love the scarf. You look so so cute! love the polka dots and that rad ring you're wearing too. This outfit is adorable!! I love the pop of purple from your scarf! 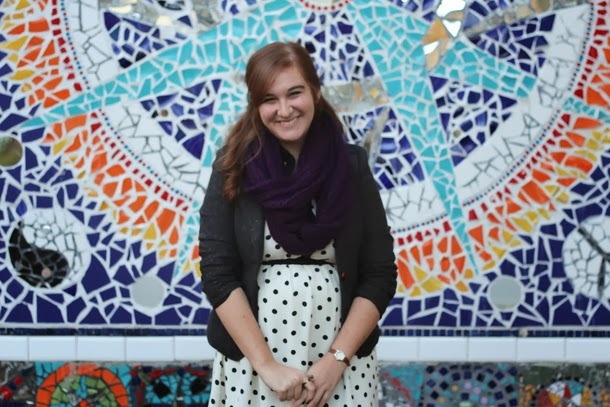 "Naturally, I'll always find away to ignore the massive amount of studying I should be doing to write about polka dots and blazers instead." Yup, sounds about right. God forbid that my school work interferes with blogging! Ha! we did the same thing when we went to Vegas w/ friends a few years ago. We're both so cheap that we spent I think $3 between the two of us and even that felt like a waste of money. pretty cool you got $10 free, it's just silly but kinda fun w/ friends (I mean, when it's not big bucks, then it becomes way more than silly and makes me upset that people actually do but that's a side rant). i hope your projects, etc. are going well! researching japan's textile industry actually sounds awesome! oh and i love love love this mural. i'd have like every other dya photoshoots there if i saw it. and i love the blazer, great mix of vintage that you can still wear and look normal and professional and i'm loving it mixed w/ the cowl and dress. so cute! and i too have the hardest time paring down pics, but i've been trying to post fewer lately. i was inspired by my friend of Hippie go Lucky, how she only posts a few really great ones in each post, which i def dont do, but good motivation for me.